Over the last three years, we’ve seen beauty draw on inspiration from the food and drink industry. Everything from packaging and scent to aesthetic. A rise in typical kitchen ingredients, superfoods and drinks making their way to the bathroom shelf. 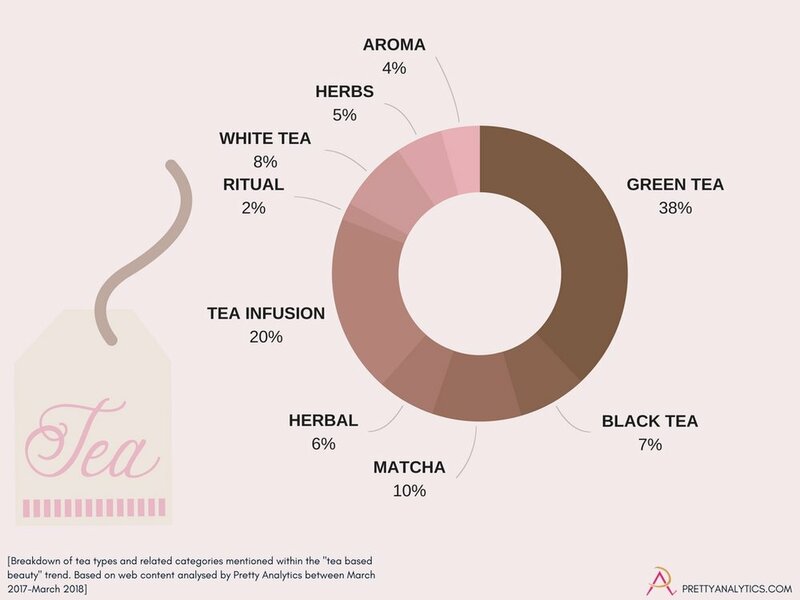 Pretty Analytics took to analysing qualitative web content around the trend topic of “tea-infused beauty”. Packed with antioxidants, teas of various origin are being highlighted as key ingredients in skincare (particularly face masks) and are now making their way across to body and hair care. For the latter, tea (and coffee) are being used more for their scalp invigorating effects and in hair loss/thinning products. With scalp care being of growing importance to consumers and “skincare for hair” emerging as a trend in action, it’s a brilliant area for brands to innovate. Green tea holds the throne as the most popular tea and is prominent among Korean skincare products. In particular, Matcha is a growing favourite. This reflects from its impact in the wellness industry. Similarly, drinks such as golden milk and turmeric lattes have also encouraged a growing use of the spice in the superfood skincare trend. Breakdown of product categories discussed in web content about "tea infused beauty" between March 2017 and March 2018. Breakdown of tea types and related language in web content about "tea infused beauty" between March 2017 and March 2018. Growing segments highlighted in web content about "tea infused beauty" between March 2017 and March 2018. As well as breaking down the most popular teas infused in beauty products, the language used was also important. Tea ties in with the growing self-care movement and slow living approach that encompasses visuals, scent and emotional connection. We expect to see more brands embracing the world of tea in facets beyond the ingredient alone. Tea has strong traditional values (for example, the Japanese tea ceremony). Inspiration can be drawn from these rituals through connecting self-care to more mindful beauty routines, packaging, aesthetics and application. With this in mind, body care’s use of tea infusions will rise providing skin beneficial, sophisticated formulations and a more luxury bathing experience. For example, The Body Shop’s Bath Teas to create a relaxing bath soak inspired by brewing loose leaf tea in a diffuser. Other brands, such as Bubble T Cosmetics, have created single bath tea bags. The final data visual explores the growing segments that tea-infused beauty are influencing. As expected, the wellness industry weighs in heavily alongside the expanding “green beauty” sector. Beauty retailers such as Content Beauty and Cult Beauty are stocking more tea blends in line with inner well-being, further cementing this connection. However, what was most interesting was the percentage of men’s products that are bringing tea ingredients into their formulations. It reflects the growing importance of the male grooming sector and its attention to sophisticated formulations. Could Beauty Have A Bright Future On Spotify? Exploring how Spotify and brands can tap into the strong connection between music and beauty with a tailored eCommerce platform and a new wave of marketing and exploration. Emerging Trend: "Skincare For Hair"
"Skincare for hair" is an innovative shift discussed in the Hair Future Forecast. Here, we breakdown and define this trend and where it's heading through behaviours and aesthetics.